SeQent’s FirstPAGE™ product family delivers real-time, automated status messages to a specified hierarchy of individuals via personal communication devices such as smartphones, tablets, pagers, email, and Motorola MOTOTRBO™ digital radios. This single application allows everyone with any kind of a messaging device to be loaded into a single database that can be shared with all applications in the organization. The FirstPAGE product family includes various components which provide a complete high volume text messaging ecosystem. 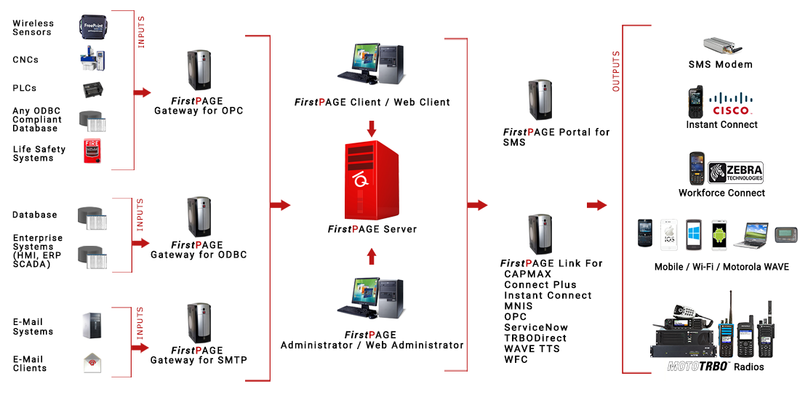 The FirstPAGE Server is the core of the FirstPAGE automated messaging product family. Provides a centralized interface to multiple messaging providers and implements distribution lists, scheduling, queuing, automated failover provider paths, and connection management. Allows easy local or remote management of the FirstPAGE messaging engine and enables the creation of configuration, monitoring of activities, viewing of logs, and message audit trail. Provides a path for external data to flow into the FirstPAGE Server for publication to any FirstPAGE Destination. These components build bridges to standard manufacturing industry inputs (OPC, ODBC) and allow for generic input with E-Mail (SMTP) mailboxes. Provides a manual messaging interface available as a Microsoft Windows-based application or a web-based application. Capable of sending manually composed messages with either of these interfaces to any destination within the FirstPAGE framework. Extends the capabilities of the FirstPAGE Server to allow dispatch to devices hosted in complex communication networks or proprietary systems. Using Links, FirstPAGE Server may dispatch text messages or text to speech audio to various systems. Allows end user devices to control what messages they receive via a simple text messaging interface and provides remote control of their associated FirstPAGE Destination state (enable/disable). To learn more about FirstPAGE™, visit our Product Page.